A good way to think about higher-order aberrations is that each point on the eye has a slightly different refractive error. Put another way, each point on the eye needs a slightly different eyeglass prescription to correct it perfectly. When an eye doctor typically checks your eye for imperfections (refractive error), he or she measures only one point—the center of the pupil. Wavefront technology measures the eye at 240 points, making the assessment of the eye much more precise. Fortunately, a lot was known about higher-order aberrations even before they were discovered in the human eye. Astronomers have problems with higher-order aberrations from their telescope lenses and from the atmosphere itself. Astronomers had already developed a way to measure higher-order aberrations using a sophisticated device called a wavefront analyzer. They used these measurements to sharpen the image of distant galaxies. Researchers applied wavefront analyzers to measure the higher-order aberrations of the human eye. Instead of measuring only one point on the eye, a wavefront analyzer measures 1,200 different points on the eye. This measurement provides a more detailed map of the eye’s higher-order aberrations. These measurements are fed into the excimer laser, and the laser corrects not only the myopia, hyperopia, or astigmatism, but also the higher-order aberrations. The result is that many more people can see 20/15 or even better. With the data from the wavefront analysis, an ophthalmologist can now perform LASIK surgery that detects, measures, and corrects both low-order and higher-order aberrations. This process of measurement and treatment of higher-order aberrations is called wavefrontguided LASIK (Figure 17). Patients who undergo wavefront-guided LASIK have a faster recovery, sharper vision, and fewer side effects. A study at the Naval Medical Center in San Diego compared the results of Navy patients who had had conventional LASIK with the results of those who had had wavefront-guided LASIK. The results of the study indicated that 88 percent of conventional LASIK patients had achieved 20/20 or better vision six months after surgery. In contrast, 97 percent of the wavefront-guided LASIK patients had achieved 20/20 or better vision after the same time period. 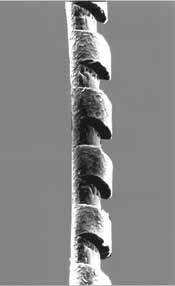 This human hair, which has been ablated by an excimer laser, shows the precision with which the laser works. Photo courtesy of Abbott Medical Optics. Dr. Edward Manche and his research group at Stanford University compared wavefront-guided LASIK to conventional LASIK to determine which treatment was more effective in producing supranormal vision— vision better than 20/20. In the wavefront-guided group of eyes, 56 percent achieved vision of 20/12 or better. That is vision good enough for professional baseball. In contrast, only 41 percent of the eyes treated with conventional LASIK achieved 20/12 vision, although this is still a very respectable result. Wavefront-guided LASIK may actually prevent some of the side effects that occur more often with conventional LASIK. Some patients who undergo conventional LASIK have problems with starburst or halos around lights at night or in dim lighting. These side effects usually occur because conventional LASIK can increase some higher-order aberrations. Because wavefront-guided LASIK is designed to correct these higher-order aberrations, such side effects are less likely to occur. The Naval study showed that 30 percent of conventional LASIK patients reported an increase in seeing halos around lights at night, especially when driving. None of the wavefrontguided LASIK patients reported this side effect. Overall, the study concluded that wavefront-guided LASIK offers patients better quality of vision than conventional LASIK, and it significantly decreases night-vision problems, such as halos or starburst. Wavefront patients reported a greater level of satisfaction with their results than the conventional LASIK group did. In practical terms, getting better than 20/20 vision isn’t that important; most people are very happy with 20/20 after having had poor vision for much of their life. But super-clear vision is very nice, indeed. You can go to a baseball game and see the expression on the pitcher’s face or read a street sign from a quarter mile away. You can sit in the back row of a movie theater and see every detail on the screen. Sight is precious. I believe that your eyes should have the best possible treatment. It should be clear that wavefrontguided, all-laser LASIK is the best way to perform LASIK. It is what we use for all our LASIK patients to get the best possible distance vision. The U.S. Navy agrees with me: all jet fighter pilots who have LASIK get wavefront-guided, all-laser LASIK. NASA agrees, too—their astronauts undergo the same type of LASIK procedure.